Hemel Hempstead Town FC will be holding a mini tournament on Sunday which will act as a trial for next season’s eagerly-anticipated Community Education Programme. The two-year academy programme will provide youngsters with youth team football under the guidance of Tudors first team manager Dean Brennan and members of the first team squad, as well as the chance to gain a BTech qualification in sports science. We want to make the academy the heartbeat of what we do at this football club. “We’ve got 14 or 15 lads signed up so far which has been a good effort from everyone involved in a few open evenings that we have held,” said Hemel Town FC director of football Steve Boone. “We have got some more activities planned, including a free-to-enter mini tournament coming up on Sunday when we will be looking at some more players. “There will be some of the first team players there on the day and they will be getting involved and handing out some trophies afterwards. The academy kicks-off in September, and Boone is hoping that this will be the start of something big for the club. 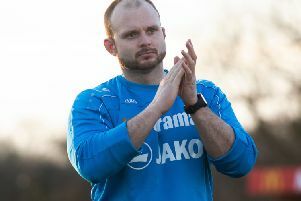 “We are looking at other recruitment avenues, but the fact that there are other clubs on our doorstep who are playing in a higher division than ourselves means that then have three or four hundred trialists. “The fact is, that they won’t be able to sign them all so there might be some lads who eventually come on board with the Hemel project and experience what it is like at our football club. “So we are happy with the way things have gone and we are feeling positive. We have got some very talented lads and some bright academic lads as well.